Exclusive! A field of dreams in whisper weight fleece! 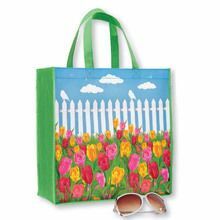 Super-soft, easy-care polyester Field of Tulips fleece blanket and accessories are the perfect choice in any season. Machine wash. Imported. Pattern placement may vary slightly. I bought the fleece "Chickadee" bedding for winter, and it was more beautiful than the pictures in the catalog. Also, so, so soft and cozy. I just washed and stored it for next season. 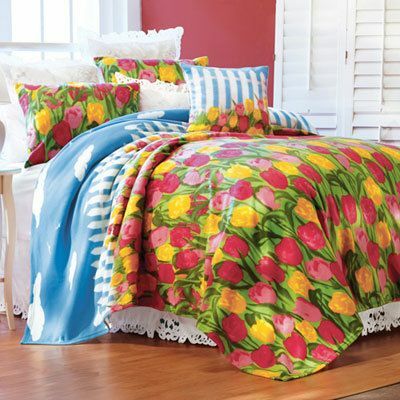 Now, I am putting on my "Tulip" bedding for Easter and spring. Love this line! Thanks, Paragon. I am your faithful customer! The colorful tulips make me smile and the fleece makes me feel warm and cozy. Ordered another set for myself and one for my granddaughter. 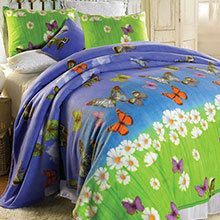 "This blanket is so ridiculously cheerful, you just can't look at it and NOT smile, even if it's not normally your taste. It was a gift to me, while going through a very hard time. Good to wrap yourself up in some happy! (haven't washed it yet... hope it holds up. will wash on gentle cycle for sure in hopes of avoiding pilling.)"